In the predawn hours of a day in October 2016, two Prince George’s County Firefighter/Medics were on their way to work at Laurel Fire/EMS Station 810 on Cherry Lane. Little did the pair know that before the start of their 7:00 a.m. shift, they would significantly contribute to saving a young man’s life and forever be remembered as angels. Firefighter/Medics Damion Duncan and Michael Dugan were traveling separately to begin their shift at the station when they witnessed a vehicle leave the roadway at a high rate of speed. Both instinctively went to help and found a young man, critically injured and heavily entangled in the wreckage of his vehicle that was wrapped around a tree. As each did what he could to assess and treat the victim, a call reporting the crash was placed to 911. The dispatcher was advised of everything needed on the scene of this accident. In July 2017, Juan Morales, along with his family and girlfriend, visited Station 810 and met Duncan, Dugan, and his other rescuers. The group spent a couple hours reminiscing about that fateful day in October. Morales, confined to a wheelchair resulting from injuries sustained in the crash, treated everyone to pizza lunch. He thanked the rescuers for saving his life and dubbed them “angels in my path”. Damion Duncan made a special impression on Morales and his girlfriend, and the trio formed a friendship. They speak on occasion and talk of going fishing together. The couple, now bride and groom-to-be, have invited their new friend to their wedding. Duncan expressed that he is “honored” to have received an invitation. He and wife Octavia are looking forward to attending the August 4th nuptials. Duncan, 45 years-old, is a 19-year veteran of the Fire/EMS Department. 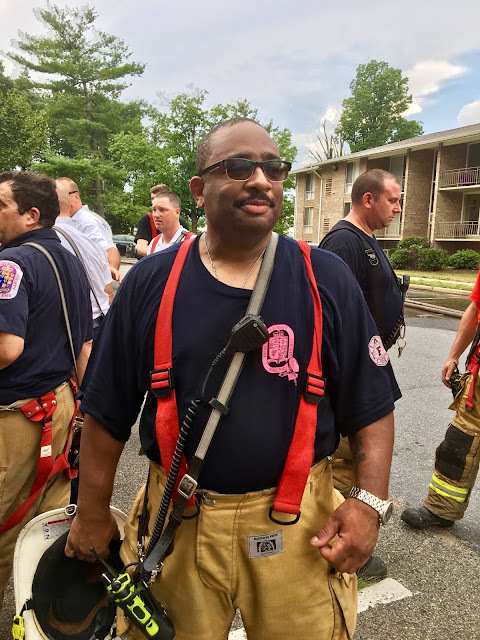 Since the crash, he has been promoted to the rank of Firefighter/Medic Lieutenant and is currently a day work supervisor at a station in West Lanham Hills. Receiving awards and accolades are nice, but they do not surpass the joy of meeting a victim whose life you had a hand in saving. Duncan will soon attend the wedding of a man who survived against the odds. His greatest award will be watching Juan Morales walk down the aisle to meet his bride without the assistance of a wheelchair. Lt. Duncan after battling a recent 2-Alarm fire in Greenbelt.